So first up Breakfast! Breakfast it the best meal of the day, is it not? Ever since I found out I couldn’t eat oats anymore, I was on a mission to find something to replace that craving. Behold: Quinoa Flakes! Amazing, that’s all I can say. I can make crazy flavor combos just like I did with my oats. The only thing is I cant make an overnight version. It only works hot. But that’s okay, I am getting used to that. They are also so satisfying and leave me feeling energized! – Add the water, mix, and pop in the microwave for 2 minutes on high. – Take it out, mix, add more liquid if you would like, and done! You can add fruit or nuts or some nut butter to top it off. So good and so easy for the morning! Next time I am going to experiment with adding Peanut Flour for some chocolate peanutty goodness! What I have used my peanut flour for is smoothies! 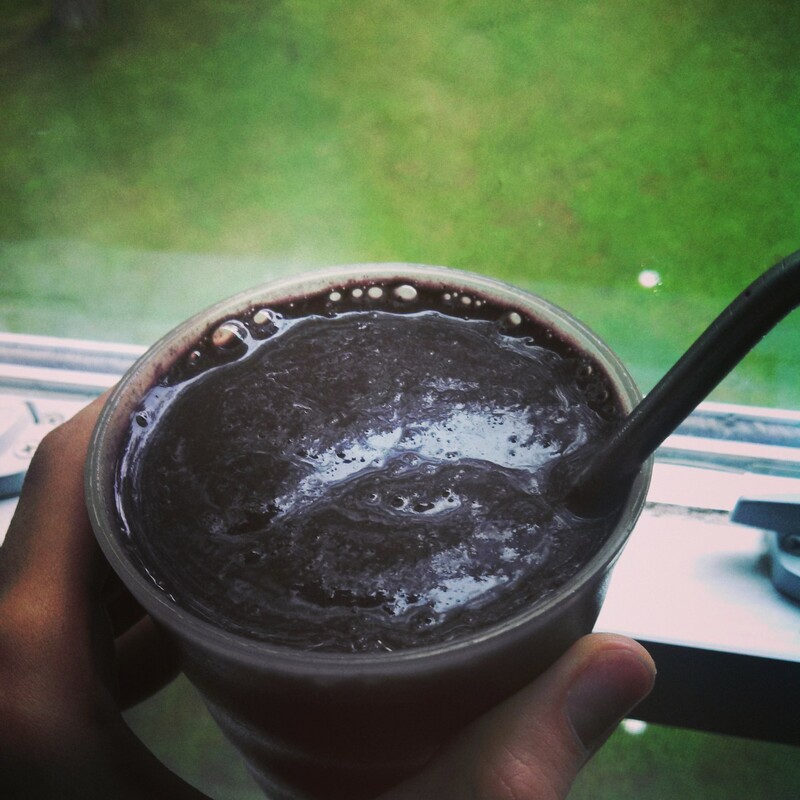 I made the greatest blueberry chocolate peanut smoothie the other day and was mmm-ing the whole time I was sipping! So I must share. – Put all the ingredients (in order) in a blender. -Blend, baby, blend! You may need to add some more liquid to get it moving. I use a drop of water sometimes because my old Oster blender is about 20 years old, but has still not failed me! Then, that’s it, drink up! Now I have kind of a random “recipe”. Instead of eating my veggies at dinner I usually have them beforehand as a snack. I love making big veggie bowls and then topping it with seeds or nuts! Perfect pre-dinner “snack”. So I bought an eggplant the other day and some zucchini. I know I was going to steam the Zucchini but really didn’t have a plant for the eggplant…I was just craving it so I bout one. 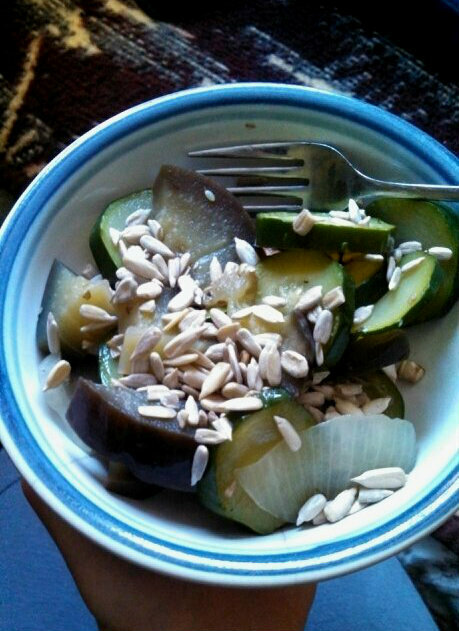 So I decided to just steam the eggplant with the Zucchini and see how it came out (steamed eggplant didn’t sound very appealing, but I was wrong.) I love when things work out! – In a large pan place all the ingredients in and mix it around, then add about 1 cup of water to the pan. – Cover the Pan with a lid and heat over medium/high heat for 5 minutes then lower to a simmer for 15 minutes or so. Stir occasionally. – Once the Veggies are cooked through, not falling apart, but soft, remove form heat and serve. Easy and Delicious! – Preheat the oven to 375°F. 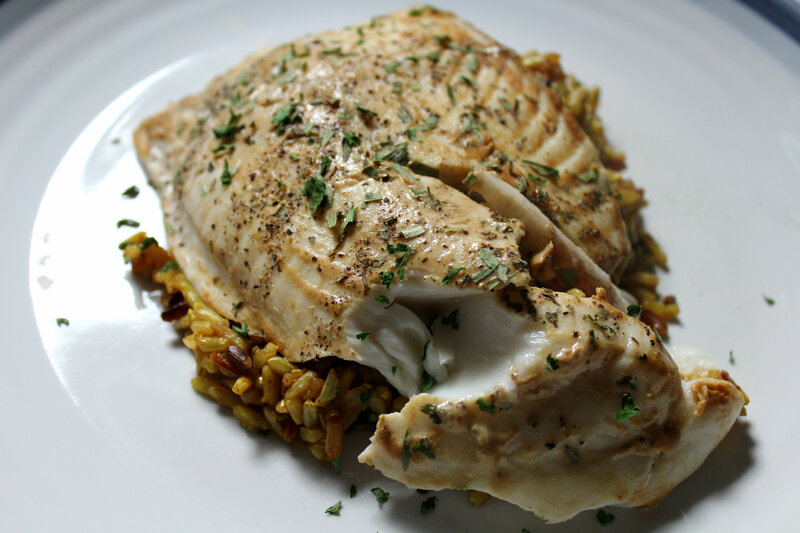 Line a pan with foil and lightly coat with olive oil or non-stick spray. 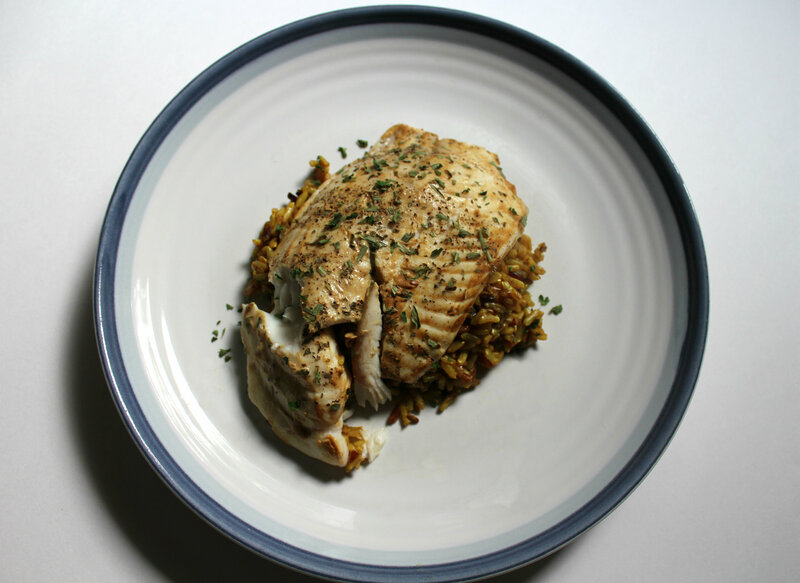 – Place the Tilapia right on the pan and rub in the Dijon. Sprinkle the Basil, Tarragon, and pepper on top. So, there you have it. Some of my favorite eats from the week. O, and I almost forgot. You always have to end the night with a delicious snack. 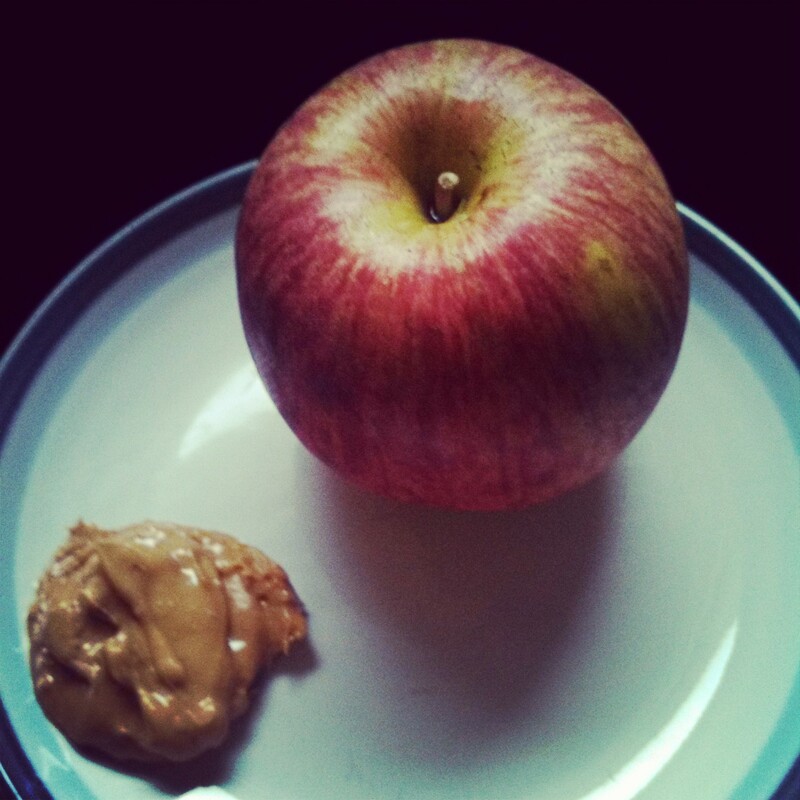 My favorite: A big Apple (this one was a Fuji) and a blob of Barney Butter’s Crunchy Almond Butter! What have been some of you favorite eats this week? Are you a fish person, or totally hate it? Thanks girl! It is so easy and simple but tastes fantastic! I want all your food! I tried quinoa flakes and couldn’t stomach them. Maybe I need to try again?? Definatly give it another try! 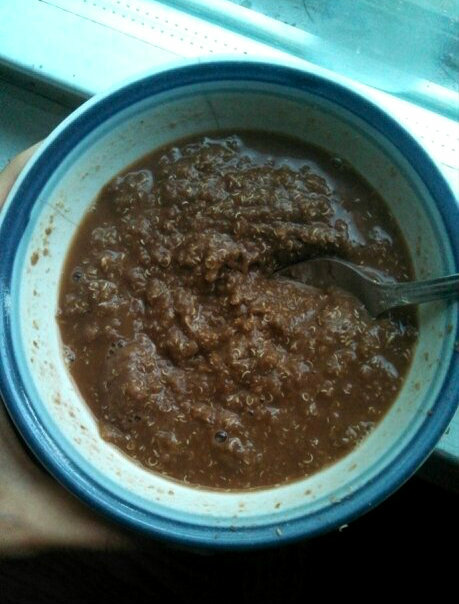 I love the nuttiness of quinoa and the chocolate just puts it over the top! 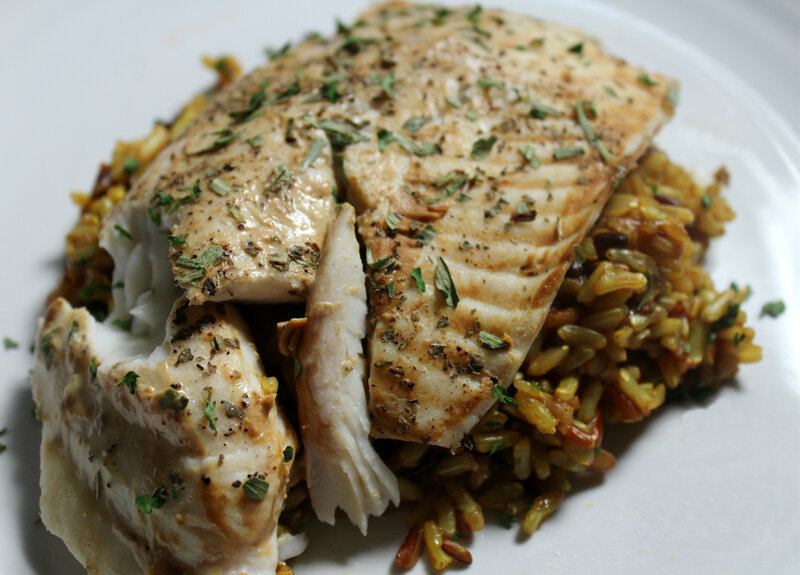 THAT TILAPIA LOOKS AMAZING. i am collecting easy recipes to make for when i live on my own and this sure fits the bill. i also have not tried barney butter but def hope to some day. it’s one of the few nut butters i have not sampled! Thanks Caitlin! And you have to try it ASAP! Barney Butter is so good! I am totally not a fish person and never have been – the texture and the smell just turns me off! Eek! This week I’ve been loving all things ginger. I haven’t been feeling well at all, but my schedule has been jam packed so ginger has been helping me to get up and get everything done and somewhat control my nausea and icky feelings! I always use ginger on days when my stomach is wonky too. Ginger isn’t my favorite but I know it can do good for the stomach so I deal.